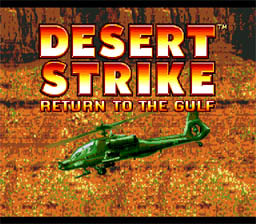 Play Desert Strike: Return to the Gulf Now! Without warning a madman has emerged in the middle East and threatens to start Armageddon. The international community knows very little about this menace, the self-styled "General" Kilbaba, but we have enough evidence of his military capabilities to take his threats very seriously. The President of the United States has chosen you to fly a series of dangerous preemptive campaigns in the desert to vanquish this inimical despot. Sometimes movies and video games are better than real life. Got a terrorist dictator starting some trouble? Instead of wasting thousands of soldiers, guns, tanks, and planes, not to mention time, just send in Rambo to single-handedly take out all the bad guys. Or in the case of Desert Strike, send in one brave pilot with his trusty Apache attack helicopter. Problem solved!